The native ceramics from the western Trans-Pecos are collectively referred to as El Paso Brownware, and are one of several distinctive ceramic traditions of the American Southwest and northern Mexico. El Paso Brownware was produced by peoples who belonged to the Jornada Mogollon culture —the easternmost branch of the Mogollon culture (one of the "big three" cultures of the Southwest). The Jornada Mogollon region encompasses the western Trans-Pecos, south-central New Mexico, and northeastern Chihuahua. The first Jornada Mogollon ceramics, known as El Paso Brown, were produced sometime between A.D. 200 and 400. They are stylistically and technologically simple and changed very little until about A.D. 800, when ceramics began to play an expanded role in food preparation technology, particularly in large-scale food processing. At this time, Jornada Mogollon peoples began to produce El Paso Bichrome, which was quickly followed by Early El Paso Polychrome. Though they retain the same vessel forms as El Paso Brown, these types of ceramics are decorated with simple geometric designs. It is not known whether these three types were briefly produced at the same time, or if they replaced one another in rapid succession. Around A.D. 1200 or 1250, Jornada Mogollon peoples began to produce Classic El Paso Polychrome. This type differs from the previous types of El Paso Brownware in its more elaborate designs and new vessel forms. Unlike most ceramic types, Classic El Paso Polychrome was never produced in conjunction with a plain, utilitarian type. Instead, the lower portion of its vessels (the part that comes into contact with heating fires) is undecorated, in essence allowing it to serve both as a decorated and utilitarian ware. In addition to producing their own ceramics, Jornada Mogollon peoples acquired ceramics from their neighbors. The most common intrusive ceramic types found in the region are Mimbres Black-on-white from southern New Mexico, Chupadero Black-on-white from east-central New Mexico, and various ceramic types from the Casas Grandes region of northern Chihuahua, Mexico. Though Jornada Mogollon peoples primarily acquired ceramics from nearby areas of New Mexico and Chihuahua, ceramics from as far away as northern New Mexico and parts of Arizona have also been found in the region. The El Paso Brownware ceramic tradition came to an end when the pueblos of the Jornada Mogollon region were abandoned around A.D. 1450. For the next 230 years, little is known about any ceramics that may have been produced in the Trans-Pecos. The exception to this is the La Junta district, where ceramics began to be produced for the first time around A.D. 1450. Seven types of La Junta ceramics have been named, but none have been formally defined and studied in detail. Some are undecorated utilitarian wares, some are unpainted textured wares, and some are decorated red-on-brown wares. The La Junta ceramic tradition came to an end in the mid to late 18th century. At the beginning of the Spanish Colonial/Post-Pueblo Revolt period in A.D. 1680, the Historic El Paso Brownware ceramic tradition was established by the Indians living in the missions of El Paso. 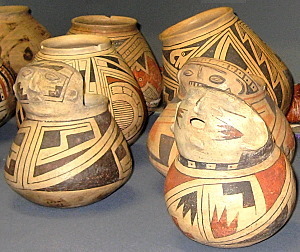 This tradition consisted initially of undecorated utilitarian brownwares, such as Ysleta Brown, Socorro Brown, and Socorro Smudged, but these types were soon followed by decorated red-on-brown wares, such as Socorro Red-on-brown, which features designs that blend Native and European styles. The Mission Indians also participated in regional exchange networks, particularly along the Camino Real, and acquired indigenous ceramics from the pueblos of northern and central New Mexico as well as factory-made ceramics from Mexico. 1999 Discourse in Clay: Ceramics and Culture in Historic Socorro, Texas. Bulletin of the Texas Archeological Society 70:421-438. 2004 Settlement and Ceramics in Northern New Spain: A Case Study of Brown Ware Pottery and Historical Change. In: Surveying the Archaeology of Northwest Mexico, edited by Gillian E. Newell and Emiliano Gallaga, pp. 265-288. The University of Utah Press, Salt Lake City. 2004 The Arroyo de la Presa Site: A Stratified Late Prehistoric Campsite along the Rio Grande, Presidio County, Trans-Pecos, Texas. Report prepared by the Center for Big Bend Studies, Sul Ross State University, Alpine, Texas, for the Texas Department of Transportation, Austin. 2004 Ceramics as Temporal and Spatial Indicators in Chihuahua Cultures. In: Surveying the Archaeology of Northwest Mexico, edited by Gillian E. Newell and Emiliano Gallaga, pp. 177-204. The University of Utah Press, Salt Lake City. 1996 The Chronometric and Relative Chronology Project. Archaeological Technical Report No. 5. Anthropology Research Center and Department of Sociology and Anthropology, University of Texas at El Paso, El Paso. 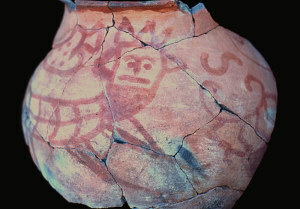 1995 Prehistoric and Historic Aboriginal Ceramics in Texas. Bulletin of the Texas Archeological Society 66:175-235. 1994 Turquoise Ridge and Late Prehistoric Residential Mobility in the Desert Mogollon Region. Anthropological Papers No. 118. The University of Utah Press, Salt Lake City. El Paso Brown ceramics on display at the El Paso Museum of Archaeology. El Paso Brown was the first native ceramic style to appear in the Trans-Pecos. These ceramics were technologically and stylistically simple and varied little throughout their period of manufacture between A.D. 200/400 and 1050/1100. Photo by Susan Dial. Classic El Paso Polychrome is the most elaborate and complex Jornada Mogollon ceramic style. Vessels from this style were decorated in red and black pigment with alternating parallel or interlocking bands and geometric designs. Classic El Paso Polychrome was produced only briefly, from A.D. 1200/1250 until the pueblos of the Jornada Mogollon region were abandoned around A.D. 1450. 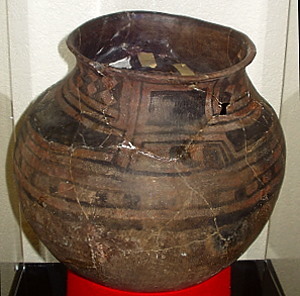 This jar belongs to the collection of the El Paso Museum of Archaeology. Photo by Susan Dial. 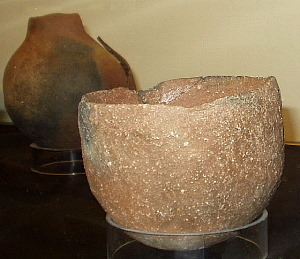 “McCutcheon pot” found in a rockshelter 10 miles north of Fort Davis in the early 1930s. This unusual vessel combines traits of several different La Junta ceramic types, including an unobliterated rim coil like Chinati Filleted Rim, heavily wiped or brushed surfaces like Chinati Scored, and a stuccoed lower body like Capote Plain. The La Junta ceramic tradition began as the El Paso Brownware tradition came to an end around A.D. 1450, and continued until the mid to late 18th century. TARL Archives. 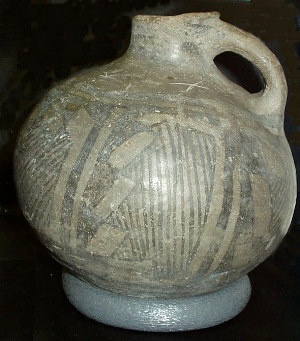 Chupadero Black-on-white ceramics were made in east-central New Mexico from A.D. 1150 until 1650. They are some of the most widely distributed ceramics throughout Trans-Pecos Texas and New Mexico. 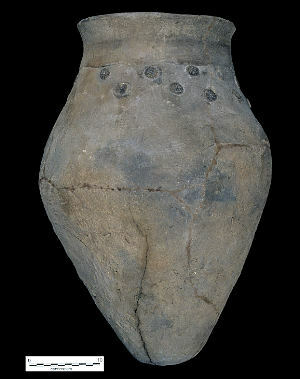 This jar belongs to the collection of the El Paso Museum of Archaeology. Photo by Susan Dial. Mimbres Black-on-white ceramics were produced in the Mimbres region of southern New Mexico from A.D. 900 until 1150. They are characterized by their fine design execution and highly stylized naturalistic representations of animals and humans. Along with Chupadero Black-on-white, they are some of the most widely distributed ceramics throughout Trans-Pecos Texas and New Mexico. This jar belongs to the collection of the El Paso Museum of Archaeology. Photo by Susan Dial. Ramos Polychrome effigy vessels on display at the El Paso Museum of Archaeology. Ramos Polychrome ceramics were produced in the Casas Grandes region of Chihuahua, Mexico from A.D. 1250 until the region was abandoned around 1450. They are characterized by fine-line red and black designs and are considered the pinnacle of the Casas Grandes polychrome ceramic tradition. Photo by Susan Dial. Socorro Red-on-brown jar recovered from the Old Socorro Mission. This vessel was made by the mission’s Piro or mestizo inhabitants sometime between 1684 and 1740 and represents a blending of Native and European styles. Its depiction of a human head on the body of a lion is what art historians refer to as a “Grotesque,” and may be an expression of the Catholic faith. TARL Archives.